When it comes to the interior design of a workspace, employers have an opportunity to enhance productivity and improve employee morale. Here’s what employers should know when it comes to office design and remodeling ideas to improve the workplace. Studies have shown that employee productivity can be affected by an office’s layout and design. An open office layout makes it easier for employees to communicate, but too much openness can make it difficult to focus on individual tasks. In general, companies that rely heavily on collaboration will require more open space and meeting areas than companies valuing individual work. A commercial contractor can help employers plan new office design and remodeling projects to enhance their spaces. The right workspace will encourage employees to produce high quality work in an engaging environment, but there’s more to it than just optimizing the floor plan. Everything from wall color to air temperature plays a role in employee productivity. An office that maximizes the use of natural light, offers employees views of the outdoors, and eliminates noises that can distract employees is much more conducive to productivity than one with harsh fluorescent lights, high levels of humidity, and distracting noises. Sometimes, it’s unrealistic to completely redesign an office, but fortunately, there are a few easy ways to improve the space. Adding pops of blue and yellow as accent colors throughout the office will stimulate the mind and inspire creativity, and plants filter the air, creating a more comfortable environment for employees. View our Commercial Gallery for inspiring office design ideas. Employees’ personal workstations also need to be optimized for productivity. Clutter decreases productivity, so those stacks of files and important documents should be organized, labeled, and stored away. Workspaces should also be ergonomically designed to enhance employee comfort and minimize health risks like back pain and fatigue. Screen supports help position the computer monitor at eye level, and ergonomic chairs reduce pressure on the back and improve posture. Adding a plant to the desk can increase productivity and improve cognitive function. 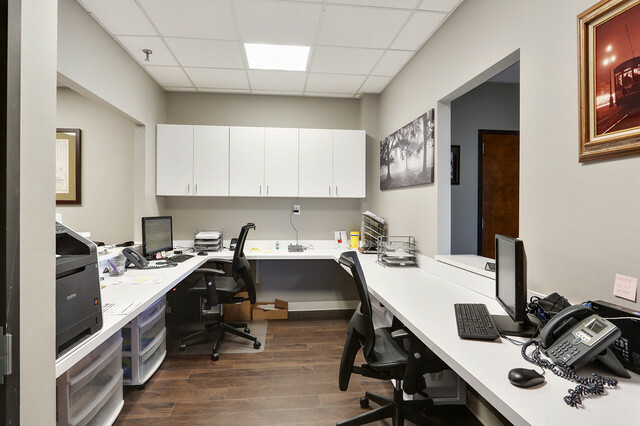 Contact a commercial contractor for more office design and remodeling ideas.